Following the post-war baby boom, and a burgeoning prosperity in the West, the 1960s were awash in cars as well as enterprising young people. It was almost inevitable that the practice of phone booth stuffing (remember phone booths?) gave way to car stuffing. 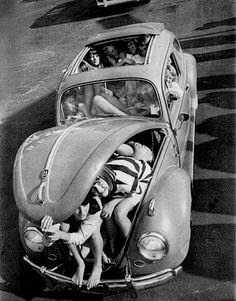 At the time, the favourite car to stuff with people was the VW Beetle. And the Morris Mini. Around the same time, concern about world population - or rather, over-population - began to surface among the general public. Maybe being immobilised over the steering wheel by the bodies of friends made people think. Today it is clear that there is not a single global problem - social justice, planetary pollution, overfishing, climate change, resource depletion, you name it - that is not made worse by our rising numbers. And slowly, tentatively, we are actually starting to talk about it. Because it is such a sensitive subject, most of us tend to shy away from it. But like with many taboos, simply keeping our silence doesn't make the problem go away. It's time to grow up and face the issue. Which means having a civil discussion about it. The place to start? First, let's get our information right. A lot has happened since the 1950s in terms of how many babies are born, and where. In a fabulous TED talk which is well worth 20 minutes of your time, Hans Rosling sets out to dismantle, in an accessible and convincing (and very entertaining) way, various myths about world population: "The Best Stats You've Ever Seen". Rosling points out that, while the global population is still increasing, our overall fertility rate is decreasing. In fact, we are now at what he calls "peak child": if the trends continue, the number of children that are on the planet today is the largest the world will ever see. "Trends in TFR 1950-2050" by Rcragun - Own work. Licensed under CC BY 3.0 via Wikimedia Commons. The graph above shows the declining fertility rate worldwide in the blue squares. The replacement fertility is 2.1, that is, a population where there are 2.1 live births per woman is a stable population. 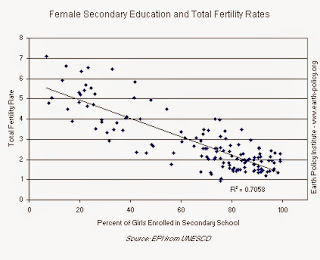 The graph also shows that less developed nations have a higher fertility rate than developed nations. This is because fertility is well correlated with economic prosperity. In Japan, for instance, increasing prosperity has been accompanied by a drop in the total fertility rate, from abour 5 per woman before the Second World War to about 1.4 today, well below the replacement rate, a major cause of the greying of Japan's population. But economic prosperity is not the only determinant: even more important is the level of women's education. As an example, the total fertility rate (TFR) in Russia plummeted to less than 1.2 live births per woman after the fall of the Soviet Union, when economic conditions deteriorated. However, even though the breakup changed the economic conditions drastically, the level of women's education remained high. And that is key. Russian women simply decided that a crash is not the right time for bringing babies in the world, and postponed having families. In 2013, the Russian total fertility rate was back up to 1.7 live births per woman. For the worldwide situation, while Rosling shows the clear correlation of total fertility rate and economic prosperity, the actual causal connection is that as families pull out of poverty they can afford to send their daughters to school as well as their sons. Educated women know to learn about birth control and its benefits, and to avail themselves of it. Looking for a solution to world overpopulation? I'd put my money - quite literally - in girls' education. This post was written for a Change the World Wednesday challenge hosted by the Reduced Footprints blog. I'm with you ... education! Thank you for an excellent post and for the link to the TED talk.